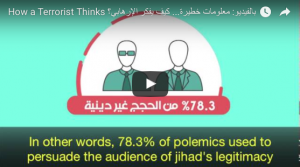 The majority of people promoting “jihad” online are using political rather than religious arguments, according to a study by two UAE-based think-tanks. The report, by the Abu Dhabi-based Future Centre and the al-Mesbar Centre in Dubai, was released as a video called “How a Terrorist Thinks”. The study analysed 45,000 Arabic-language Twitter posts by individuals who have either perpetrated terrorism attacks or were involved in training for such attacks, as well as 789 YouTube videos and numerous blogs. According to the study, 59.7 percent of those made purely political arguments in their propaganda, rather than religious arguments. A further 18.6 percent used “social criticism” while 21.4 percent invoked religious reasoning. “In other words, 78.3 percent of polemics… are essentially non-religious and and prinicipally sociopolitical,” concludes the study. It also noted that the rejection of “Zionism” only appeared in 3.7 percent of the material studied, while direct attacks on Israel did not feature at all. The authors said they had chosen the video medium specifically to challenge militant groups’ own propaganda methods.